We have expanded this week with the addition of five stations in Stanley Park! The new ‘Mobi by Shaw Go’ stations have been installed at: Vancouver Aquarium; the Totem Poles near Brockton Point; the Information Booth near the park entrance; Second Beach North; and Second Beach South. 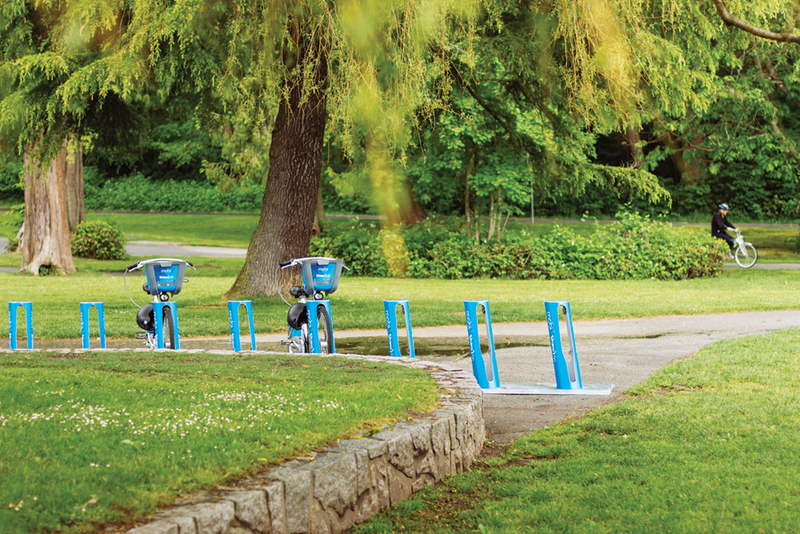 Adding Mobi stations to Stanley Park helps to promote an active lifestyle both for those who are visiting the park, as well as for those who work in the park. People who grab a Mobi to attend an event in Stanley Park won’t have to worry about finding parking, and can enjoy the beauty of the park as part of their trip. In September 2016, the Vancouver Park Board approved the installation of public bike share stations in its parks. Another station is planned for Stanley Park at Third Beach, and City, Parks, and Pavilion staff are working together to find a suitable location for a Mobi station near the Stanley Park Pavilion. Mobi bike share stations are already located at: Kitsilano Beach Park; Sunset Beach West; Coal Harbour Community Centre; and the Aquatic Centre. A station is also planned for the English Bay Bathhouse roof plaza. You can view the location of all active bike share stations, and check availability of both bikes and docking stations, on the Mobi web site. Visitors to the city who are planning a longer ride or riding with children are encouraged to use one of Vancouver’s many bike rental shops; Mobi bikes are one size and specialized equipment (such as child trailers) is not available.